Regent Antiques has been trading in London for three decades. We specialise in English and Continental antique furniture, silver and porcelain. Our main markets are Europe and North America and we export worldwide. 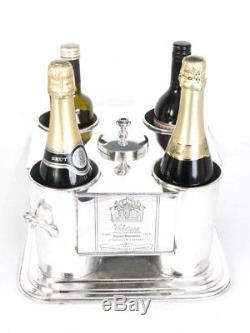 French Silver Plated 4 Bottle Wine Cooler / Ice Bucket. This is a beautiful new silver plated wine cooler. A lidded section for crushed ice sits between the four crafted bottle compartments, making sure your bottles are at the perfect serving temperature. The wine cooler has engraved inscriptions in front and back. Chateau Cos D Estournel, Grand Cru Classe. This wine cooler is perfectly suited to a formal dinner table or informal gatherings with friends. In very good condition, please see photos for confirmation. Height 23 x Width 35 x Depth 35. Height 9.1 x Width 13.8 x Depth 13.8. Take a tour of our London showrooms. Take Piccadilly line to Manor House station. Go to top of escalators and turn left. Take exit 7 and walk straight on for 10 metres. Manor Warehouse is on the right. There is car parking available on site. Please make all cheques payable to Regent Antiques. Bank details: Regent Antiques - BBVA - Account: 05701615 - Sort: 23-59-11. For the best value, we recommend offsetting this cost by purchasing multiple items. The item "French Silver Plated 4 Bottle Wine Cooler / Ice Bucket" is in sale since Wednesday, November 1, 2017. This item is in the category "Antiques\Silver\Silver Plate\Other Silver Plate". The seller is "regentantiquesuk" and is located in London N4 1BX. This item can be shipped worldwide.